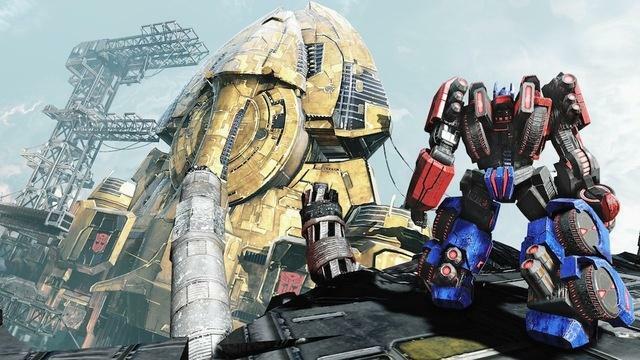 It seems GameTrailer's report for Transformers: Fall of Cybertron (FoC) was just the beginning of another mini-blitz of press coverage. Very little of it is new, re-iterating what we were told from the last wave of coverage a few months ago. The main takeaway is all the writers are excited about the potentially awesome game that is currently scheduled to be released in September 2012. From what I have seen and read, if you enjoyed the first game, you will love the second. If you were on the fence because of some of the problems with the first game, High Moon has made efforts to overcome them. Below are the links for more, here are the highlights from GamesRadar. - Fall of begins right after War for Cybertron: The Autobots lost with the Decepticons trying to prevent them from leaving and Prime and company trying to buy time to escape. - Each character has a unique ability: Jazz has a grappling hook, Prime has Metroplex, Combaticons combine, etc. - Dinbots return with new origin story: Grimlock is a playable character with unique ability of transforming into very powerful T-Rex alt mode. - Cybertron has greater variety of environments, not just flat plains. - No co-op but will be greater emphasis on multi-player modes with larger variety of character creation options. Hit the link for full gallery of first wave of FoC toys that were shown off at Toy Fair and includes the five Combaticons that combine to form Bruticus. The release date is unknown but will be released under the Transformers: Generations banner. Nineteen images from the game that show off its graphical potential. Most of this is identical to GT.TV's report but without the edits and voice-overs hiding the sound. Also briefly shows off Vortex. This IGN article and video gives overview of the character abilities and direction High Moon is trying to take the game with focus on character abilities. Comic Book Resources take on the game, covering same ground as other articles.